It’s enviable – the energy and enthusiasm of that person (we all know them) who proclaim they’re “a morning person” and wake up every day ready to-go with a smile (and a matching workout ensemble). The reality is, for most people, mornings are tough. With so many commitments and responsibilities from family to work to exercise; morning is prime real estate for productivity amidst a busy schedule. With a few adjustments to your routine, you can maximize your time in bed, wake up energized and conquer the morning before the rest of your day even begins. It’s no scientific breakthrough that a good night’s sleep will help you wake up refreshed in the am. However, catching the proper amount of Zzz’s can be easier said than done. A lot of factors can play a role in getting the recommended seven to eight hours of quality sleep our bodies need regularly. Maximize your time between the sheets by powering down electronic devices (including the television) an hour before bed, according to an article from Everyday Health. Set a recurring alarm that cues you to go to bed around the same time every night to get the proper amount of sleep regularly. Similar theory to ripping off the band aid, wake up when your alarm goes off. 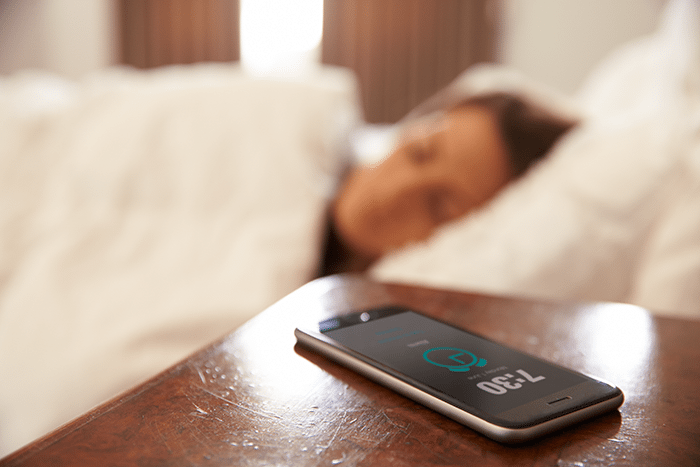 Don’t give yourself the chance to hit snooze. If you do, utilize that snooze-time to recite a morning mantra for waking up and getting your day started. For example, if you want to make it to a workout class, after you hit snooze, say to yourself “go workout, go workout, go workout … ” This will prevent you from going back to sleep and mentally prepare you to wake up. Other tactics to get out of bed quickly include putting your alarm clock across the room so you’re required to get up to turn it off, or make your alarm an energizing song that fires you up for the day. Having a specific goal for waking up early will provide you more of an incentive to actually get up. Do you want to get a workout in before your day starts, eat breakfast with your family or tackle a few at-home to-dos before work? Having a source of motivation to get up early will make it easier to get out of bed. Maximizing your time awake in the morning will allow you to get a few more minutes of sleep. If it takes you 10 minutes to pack your gym bag, or figure out what to wear to work, save time by planning ahead the night before. Lay out exactly what you’ll need for the next day, and savor those last few minutes in bed instead. If you find yourself waiting in line at the coffee shop, consider investing in an at-home coffeemaker that has an automatic alarm feature. Preset it the night before and fresh coffee will be brewed by the time you wake up. Keeping a set schedule on weekends and weekdays will help your body recognize and adapt to a sleep cycle. Get in the habit of sticking to a bedtime routine that you begin around the same time every night. Your body will naturally start to adjust to the earlier bedtime. Same for morning, have a plan for when you wake up such as drink water, brush your teeth, change your clothes and eat breakfast. Keeping the same routine requires less effort and energy so you’re more likely to wake up because all you need to do is go through the motions. Becoming a morning person is important – and something you should take seriously – because life is too short to start everyday dreading the alarm.